Englang versus United Kingdom versus Great Britain versus Britihs Empire versus Commonwealth Realm versus British Overseas Territories versus Crown Dependencies versus British Isles versus Little Britain versus Kenilworth explained in 315 seconds. Mike Downes - +Kat Richtman I managed 2 mins 58 secs before I had to take a time out..
Colin Hill - I love this video, I always watch it. 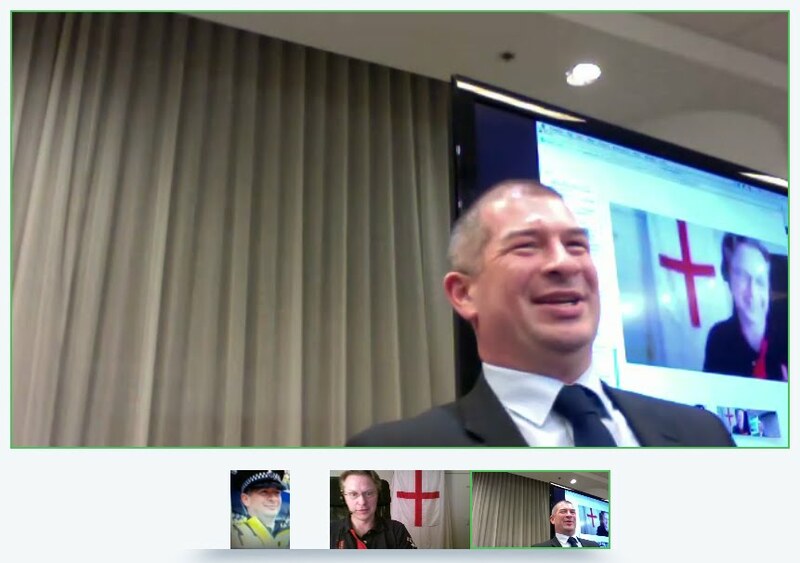 Following on from the last post it's +Kerry Blakeman and +Mike Downes arriving from within the Hangout to hit the big screen in Dallas, Texas at the #SMILEcon (Social Media in Law Enforcement). Once again, Kerry was on an iPhone. There are no boundaries with Media now.. Thanks to +Lauri Stevens +Scott Mills and all those watching. Can do it too - Yes You Can .. 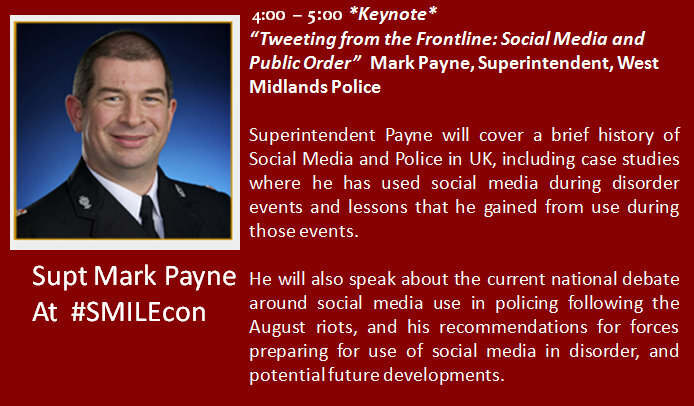 Superintendent Payne will cover a brief history of Social Media and Police in UK, including case studies where he has used social media during disorder events and lessons that he gained from use during those events. In almost tropical heat, the bridge finally opened. Here's a handful of photos from the Opening Ceremony. In the normal way, when you have more send in your own and I will link all the Tweets, Facebook and even Google Plus albums in tandem. Gary takes us to Target Results are in from a mobile trial and with newcomer (to my Circles) +Gary Gonzalez we were in his trolley and looking for items - no idea what he bought, but I was expecting some Coffee and a British Bacon Roll. No one had the decency to tell me it was Soft Furnishings..
Chief Inspector Kerry Blakeman from West Midlands Police is a regular on this site. He's now made it to Columbia, Missouri with U News @ 4 with Sarah Hill. I've been on the show for three weeks running now. This broadcast made history as it was the first time a mobile hangout was broadcast at KMOU (using an iPhone). Link to: Official KOMU Monday News Segment with Kerry Blakeman and thanks go to +Al Navas for the video. So it seems some G+ers are getting x10 to x20 more followers than before the public Open to All watershed (21 Sep 11). Here's a few random screens.. 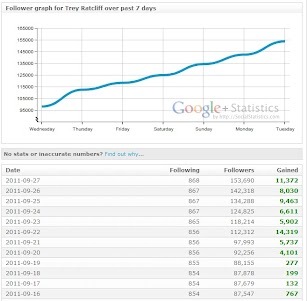 If you want hard data, go see that site, crunch the numbers and hand in your 1,000 words by the end of the day..
Moritz Tolxdorff - i nearly doubled my followers within one day! Mike Downes - +Moritz Tolxdorff Snap, I picked up loads too, but not in line with 20/21 Sep window - any ideas why? This is a glimpse of the future. 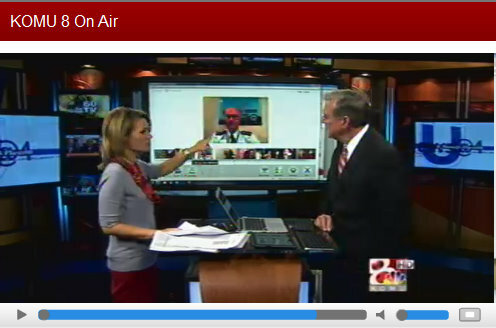 Police Officer sits in Coventry, England broadcasts live to Columbia, Missouri. What does he use - this nifty kit. Eagle Eyes will see laptop closed, suckered car clamp holding iPhone in place. All I can say is - MADE IN ENGLAND Circle +Kerry Blakeman and +Sarah Hill for more. Kerry Blakeman - That will be the last time you see my prototype! I have ordered a phone grip that screws onto a tripod - thank heavens for e bay! This blog post is hilarous. It's written on 16 May 2011 and titled: Social Media v Industrial Media v Web 2.0 - is there a difference? It's written by some berk called Mike Downes. Although, now four months old - credit to the guy, for including two G Insights Tables - if nothing else have a looksey at those. 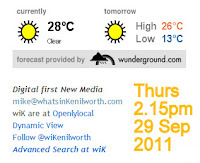 whatsinKenilworth: Social Media v Industrial Media v Web 2.0 - is there a difference? Colin Hill - I expected something from 2001 for a moment there! New from the UK, +Kerry Blakeman Welcome him to the KOMU Circle..
+Kerry Blakeman , the chief inspector of the Coventry Police Department will be joining us on the U_News @ 4 cyber couch today. Looking forward to talking to him about the use of social media during the London Riots and how police entities in mid-MO can use it to their advantage. Also on our couch today... +Mike Downes +Scott Rowson +Chad LaFarge +Kim Beasley . +Scott Rowson is a new addition to our couch. He's a Columbia Tribune Columnist and writes a great food blog. He'll be talking about what local grocers are doing to compete with the influx of niche grocers like "Natural Grocers" and "Trader Joes". You can watch the newscast live online here. See the latest about kerry blakeman and find people who share your interests. Google+ search streams bring you updates from your circles, public Google+ posts and news from around the web. 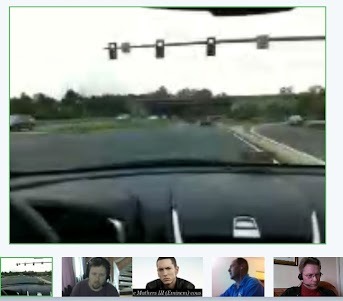 A test drive of a Mobile G+ Hangout from my IPhone 4. Here are the results in photos. Yes, I was able to take screen shot photos while Hanging Out with friends without any interruption. This is WAY COOL Google+ Peeps. U know who you are. Definitely give yourselves a pat on the back right now! Joseph Puglisi - +Mike Downes Excellent. This is very exciting. Mike Downes - +Mike Downes Dan how do you take a screen shot with iPhone (in case others do not know)? Scott Moroney - So it seems the double entries of your name are the PC/Mac log in alongside the 3G log in? This will open up a world of broader usage. Jerry Maguire: Yeah, yeah, no, no, no. Show you the Hangout. Rod Tidwell: No! Not show you! Show me the Hangout! Jerry Maguire: Show me the Hangout! Rod Tidwell: I need to feel you, Jerry! Rod Tidwell: Jerry, you got to yell! Jerry Maguire: [screaming] Show me the Hangout! Show me the Hangout! Will you let me Go Live? +Mike Downes For a serious mind and one time educator, you are funny! As a proud resident of the village Kenilworth you have my admiration. I am looking forward to a return to village life soon. It has a certain innocence that Maguire would certainly miss, don't you think? +matthew rappaport shared your post with me. And now you have gained a circle, not legal tender but a worthy thing nonetheless. Mike Downes - +Carolyn St.Charles You know I'm from Kenilworth, UK? [population 26,000 ] Thanks for the compliments..
matthew rappaport - Loving the interwebbing connections :) Circling > Currency! Carolyn St.Charles - Exactly. We would call Kenilworth a town (<50K). But village seem more UK English to me. Compliments go to the deserving. Read reviews, get customer ratings, see screenshots and learn more about Google+ on the App Store. Download Google+ and enjoy it on your iPhone, iPad and iPod touch. Don Inbody - True...just like the Android app. 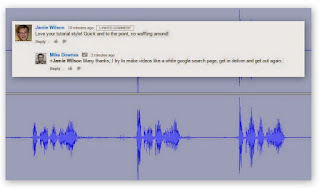 Mike Downes - +Don Inbody Thanks, I am neither Droid or iPhone user, but have many that seem to think g+ is all about mobile. It seems so long ago that folk were using laptop plus two skypes to mobile hangout. Don Inbody - I just got into a hangout with both my laptop and my Android phone for comparison. It looks pretty good side-by-side.